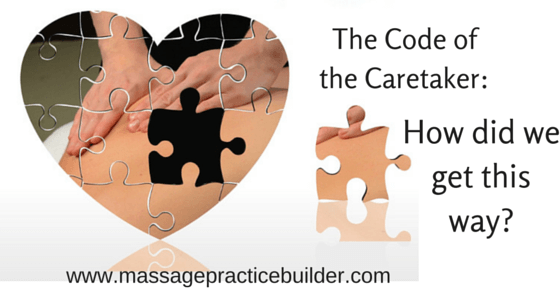 The Code of the Caretaker :How do we get this way? You are here: Home / The Code of the Caretaker :How do we get this way? Our need to help, fix and caretake others – where does it come from? Massage Therapists are not the only profession or group of people who have this! Nurses, Psychologists, Naturopaths, Acupuncturists and even Doctors have some of these same issues. What drives us to do everything we do is our needs. The last two are the most important – the need for autonomy and the need to have meaning in your life. What happens usually is that helpers will get most of their primary needs met through their practice but it is usually at the expense of the client. When our needs such as our need for control and to be needed or our need to give advice in order to feel important, start taking over the session, our clients are the ones who will suffer. Some of the reasons why people are drawn to the massage profession (or helping professions) are really secondary needs or needs of the ego. We avoid the deeper needs underneath the drives that bring us to helping professions. Early Needs – where it all went wrong. Most all of this arises from your early life from your family or significant people in your life in your early years. You somehow learned that you were not good enough, smart enough, pretty enough or lovable. You somehow learned that it was not right to have feelings and the needs behind the feelings met. Our early bonding was disrupted or not adequate enough to develop having needs and acknowledging your needs. You are most likely still trying to get those early needs met which takes you away from the present moment of just being you. I can do everything myself. I don’t need any help. I don’t have any needs. I am fine. I take care of everyone else’s needs and that is enough to take care of my self. We are forced to go to school and get good grades in classes we have no interest in. No matter what we do, we are not good enough. Were you the one in the family to take care of the other family members? Are you the one all of your friends/family come to when they need help? Often, while you are so busy taking care of everyone else, you forgot to take care of yourself. Helping comes naturally but often at an expense. You may have never learned to ask for what YOU need as a result of all of your early helping. Burnout is often a result. The need to give advice. We often feel like we must always have a solution for the clients problems. Most people seeking answers to a problem just need to be listened to and herd. They need validation for what they are feeling and who they are. The massage is just the method of communicating that it is safe and you are cared for. People have their own answers within themselves. They usually just need reflection to help discover what it is themselves. It is very empowering for a client to take responsibility for themselves and their healing process. A common theme in people getting massage is often working to much at the expense of their health. They are so busy and unable to take the time that they need to eat right, exercise, relax and be nourished. They come for massage with stiff necks, painful low backs, depression and fatigue. We can tell them until we are blue in the face that their pain will continue until they commit to taking care of themselves with regular massage or whatever the latest advice might be. People won’t be able to do what you recommend and won’t want to do what you recommend until they are in a place within themselves to do something better. That may take having more health issues or just coming in for massage once a week or whatever they can do. The need to give advice to others is usually more about your own need to be heard and feel connection and be loved. We are often drawn to the exact thing we didn’t receive enough of as a child. Even your best advice is only best for you. It is usually not best for your client or anyone else. Everyone of course needs to be needed. The problem is when you deny you have this need. It often shows up when you make last minute changes in your schedule to get that one more person in when you had other plans in your personal life. It shows up when you constantly let your cancellation policy slide because you may not want to offend the person involved. What happens is it usually feels so goo to be needed – to be the one and only person who can help someone else. This is very empowering. There is nothing wrong with this and is quite common. The problem is that when you don’t have clients that you fix or let you feel needed, your self esteem plunges. The need to make the world a better place and make an impact on clients. Thinking that we are the source of relieving others pain can make you feel more powerful and important. The problem is when clients don’t feel immediately better after a massage or some may feel worse. You may also feel like clients are just not making enough progress and that results in heavy feelings of being a failure or not being enough. Thinking that clients can be fixed sets up more of a power differential where the therapist becomes the guru with all the answers. The need to share something that changed your own life. Many people want to become massage therapists after they have been treated with massage for a life changing injury or accident. We secretly want to share the experience with others and hope that you can make such a difference in someone elses life. All of these needs are perfectly normal and there isn’t anything wrong with having them and you WILL have them. The problem is when they start to influence your practice and your work with clients at the expense of clients needs. It is an unconscious process. The more we can become aware of our own needs and feelings, the more we can be of service to our clients. Being of service is about being there totally for the needs of the clients and being present with them as they experience their pain and issues. When you work towards getting your own needs met in your personal life, rather than your professional life, it opens the doors for deeper healing to happen on the massage table. It is OK to have needs. It is OK to have needs. We all have them and we all get them met through giving massage at one time or another. This isn’t about making it all wrong or saying that you have to fix this cold turkey and stop getting your needs met through your clients. It is about becoming aware of your needs and learning how to get them met in your personal life so that you can give the client 100% of your focus to create the therapeutic relationship which is really where the healing takes place. The problem is when we get our needs for connection and attunement met through client interactions and it gets in the way of being present WITH the client and focusing on their needs. When we do something to try to get a specific reaction from our clients and get our needs met, like wanting appreciation and approval, we are being controlling. Controling comes in many forms but mainly in the form of wanting to always give clients advice on what they should be doing. It is occurring when you say things like”oh this is really bad (the muscle tension) and interrupting the clients healing process. It is when you make judgements about clients before really knowing the story like the many complainers in Facebook groups that are so judgmental about clients being late or dealing with bodily functions and things you just can’t change. The things that irritate us most around client interactions is really the best place to learn about ourselves. After 20 years and now 75 I am limiting my practice mainly to the studio in my home. Which brings my wife’s caretaker needs int the picture. Clients notoriously may want to hang around and visit after a session. My wife gets upset that I indicate by my actions that I am going to go on to my scheduled activities on the farm. Yet she complains about the stress of being hospitable when she really needs care herself. We do schedule time in our congregation activity but it needs to be clear that time scheduled for therapy can not be presumed to blend into hospitality.